Nokia today launched the Android powered smartphone recently announced at Mobile World Congress three weeks ago. The Nokia X hits Kenya as the second market to do so, just hot on the heels of India which launched earlier in the week. 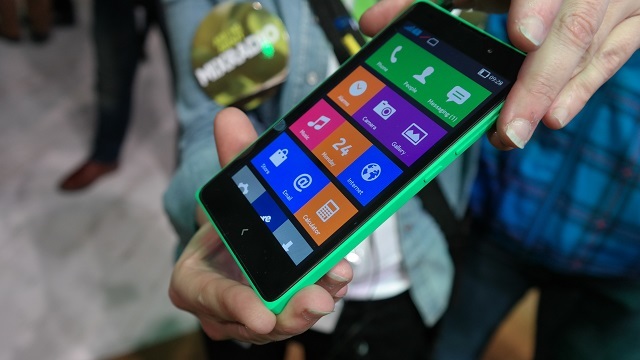 Nokia X comes as a gap in the middle of the low end Asha and the Windows Phone OS powered Lumia. Nokia X will be available from mid next week from partners like Safaricom and Mobicom. Safaricom will bundle it with a 1.5 GB bundle. It will be priced at Kshs 12500 and the usual colours of Nokia will be available by way of exchangeable covers. Also bundled in among add-ons that users will get with the Nokia X is 1 month free Skype and 10 GB OneDrive Cloud storage limitless access. Nokia XL comes in later in “a few months”. Nokia has pre-loaded local Kenyan apps, among them the Daily Nation App, Nairobi News App, Ma3Route App and Mledger Mpesa App. Tecno P5 has 1800mah, unforked 4.2.2 Jelly Bean, 5MP + 2MP for the same price. Don’t give me that lecture about quality since Nokia stopped manufacturing in Finland anyway. Let’s not forget for a minute the distribution and marketing Nokia will put on this device. Can you make a quick guess which device between the P5 and Nokia X will be hitting a million in sales? Be as it may, I feel Nokia is just playing catch up here. The truth is other devices came first, satisfied the market and people have either settled or moved on. Remember how some Telecom at one point believed they could sell “a million” Huawei Ascend Y 100? Stock couldn’t move even with rigorous marketing. If Nokia launched this product two years ago, with unforked Android, they would have hit the market at the right time. I have watched all this happen too, and believe you me there is a difference between the Ascend Y100 and the Nokia X. One, there is quite little loyalty for Huawei in this market, ask Ideos users. Two, there is a stark difference in how Nokia positions their products and Huawei, and that is the user experience, support and services available on board. Nokia does a lot of research and development, and you cannot undermine the fact that Nokia Research Office is In Kenya among very few others in the world. There is still time to see how consumers respond. I bet it will be positive. The R&D center in Nairobi now belongs to Microsoft. This means we don’t even know whether the next products will be called Microsoft X or Ostrich X. Several decades of R&D but it has still come to this. I still insist, the quicker one to react with their thoughtful ideas almost always becomes more successful than whoever follows with a pile of research papers. Time is going to prove this, again. I have been #TeamNokia since 2010. I’ll buy Nokia X as soon as possible! Unlike most Android phones, the Nokia X comes preloaded with Nokia and Microsoft-specific apps and services. That means there’s no Google Play app store. But rest assured, the Nokia X runs Android apps. excellent Moto G can be had for $179 (and as little as $99 in some instances.) And Nokia’s own, Windows-basedLumia 521 can be purchased for $99 or less. Both phones boast superior features to the Nokia X, and you get your pick of pure Android or Windows Phone. All things considered, I feel like the Nokia X can afford to be cheaper. I am using the Lumia 620. The only reason i bought the phone was because there was Microsoft somewhere on OS, otherwise i wasn’t gonna work with Nokia ever again. This is a company that failed to move with time.Where were they when HTC and Samsung were making S5 and HTC one?!! Its like a little baby who’s still learning to crawl thinking it can compete with grown ups..
BTW i didn’t like the Lumia until i got the Windows Phone 8.1 update with Cortana, it made me change my mind on selling it..